Browse our extensive collection of Jaeger-LeCoultre watches at discounted prices. Enjoy our legendary 5-star customer service and fast free shippiing to anywhere in the continental USA. JLC’s extensive technical innovations and history make it one of the most revered watchmakers in the industry. Each JLC watch is subjected to the most intense testing; a stringent 1000-hour control test. Click on any collection below to browse JLC watches. In 1833 Antoine LeCoultre opened his factory in Le Sentier, located in the Valley de Joux Switzerland, and commenced manufacturing of watches. His development of new manufacturing tools and techniques pushed the watch making world into new boundaries of reality. Until this day many famous brands rely and utilize the movements of JLC (as it is affectionately called by its many fans). His motto was "We must base our experience on science." The combination years later of Antoine's grandson, David LeCoultre, who merged the company with Edmond Jaeger started the brand name Jaeger LeCoultre. Antoine LeCoultre changed the watch-making world forever with the invention of a new system of winding, where it was no longer necessary to use keys to rewind and set watches. He devised a pushbutton that triggered a lever to switch from one function to another with much less effort on the part of the owner. This established Jaeger LeCoultre watch Company as the leading brand in user-friendliness. 1931 saw the birth of the Jaeger LeCoultre Reverso watch collection originally created for polo players. Due to the extreme nature of the game, a player wearing a watch could easily be struck in the wrist with a club that would break the glass of a regular wristwatch. Therefore, JLC created the Reverso watch which would be able to flip around to an all metal backing thereby protecting the timepiece. 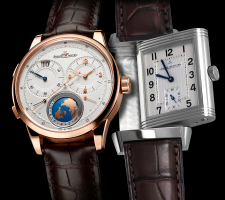 Today the Reverso watches have evolved into having various features and complications on both sides of the watch. The Reverso watches remain one of the most recognizable watches in the world and a staple in every watch enthusiast's collection. Reverso Classic Style watches include all time classics such as the Reverso Duo watch with dual time zones and the Jaeger LeCoultre Reverso Grande Taille with a solid metal back, just like that of the original Reverso watch of 1931. The Reverso Classique and the Reverso ladies have a solid metal back and are available with either quartz or mechanical movements. The Reverso Series also has a whole collection of ladies watches with and without diamonds. These watches include: The Reverso Lady Mechanical, The Reverso Lady Quartz, Reverso Florale, Reverso Neva and Reverso Lena, Reverso Joaillerie, Reverso Duetto, Reverso Duetto Joaillerie, Reverso Duetto Duo, and Reverso Duetto Classique. The Reverso Squadra watch series is the newest addition to the Reverso line, with a larger, bolder, and more square design case. The finish of the Reverso Squadra line alternates in polished and brushed finished surfaces making for a sportier look. The Reverso Squadra watches feature various complications such as: Reverso Squadra Hometime with a second time zone indicated by a skeleton hour hand, Reverso Squadra Chrono GMT, Reverso Squadra World Chrono in a limited edition, Reverso Squadra Classic, Reverso Squadra Lady Duetto featuring dual times, Reverso Lady Quartz, and Reverso Lady Automatic. The Reverso Grande XGT Size watch collection is a line of dress/casual watches in a large and more generous case size, yet keeping the proportions of the original design. The large case size allows for more exciting, advanced, and complicated movements, most notably an amazing 8 day power reserve on the manual wind versions. This watch collection includes: Reverso Grande Automatique, Reverso Grande GMT, Reverso Grande Date, Reverso Grande Reserve, and Reverso Grande Sun Moon. The Jaeger Master Compressor and the Master Compressor Diving Series are collections of sport-designed watches with various levels of sophistication and complications. Each watch in the Master series is equipped with a butterfly crown which is water and shock resistant, each with various levels of complications. This collection consists of: Extreme World Chronograph, Compressor Extreme W-Alarm, Compressor Jaeger LeCoultre Automatic, Compressor GMT, Compressor Memovox, Compressor Geographic, Compressor Chronograph Gents, and Compressor Chronograph Ladies. The Master compressor diving series watches are more robust and consist of: Compressor Diving Pro Geographic, Compressor Diving Chronograph, Compressor Diving GMT 44mm, Compressor Diving GMT 46.3mm, Compressor Diving Chronograph Ladies, and Compressor Diving GMT Ladies. The Master Control 1000 hour watch series is more classically designed round watches and have various levels of sophistication and complications starting with the classic automatic Master Control, and continuing through the Grand Complication featuring minute repeaters, tourbillons, and perpetual calendars. Among these watches are: Master Tourbillon, Master Grande Tourbillon, Master Master Minute Repeater, Master Control, Master Calendar, Master Grande Reveil, Master Eight Days Perpetual, Master Eight Days Perpetual Skeleton, Master Eight Days, Master Hometime, Master DualTime, Master World Geographic, Master Geographic, Master Reserve de Marche, Master Grand Ultra Thin 40mm, Jaeger Master Ultra Thin 38mm, and Master Ultra Thin 34mm. The Master Amvox - Aston Martin line is sportier, but still offers unique and sophisticated complications. These watches include: AMVOX-1 Memovox, AMVOX-1 R-Alarm, AMVOX-2 Chronograph with the innovative Chronograph activation via pressing against the crystal, AMVOX-2 Chronograph DBS, and AMVOX-3 Tourbillon GMT. Two more limited series from Jaeger LeCoultre include the Memovox Tribute to Polaris 1965 and the 1833 Collection - Limited Edition. Jaeger LeCoultre subjects all of their watches through a most rigorous testing process, which far exceeds the highly regarded COSC testing process. Once the movements are completely cased as they would be utilized by the consumer, the watches are then submitted for an extremely rigorous, continuous 1000-hour test. Only after successfully passing this test will the watch be allowed to leave the factory. This ensures a very consistent and accurate timepiece distinguishing JLC from the rest.